Backwards Through a Tudor Telescope: Harriot, Digges, Dee and Chekhov! Following on from my earlier blog post on 23rd August we can be confident that Leonard Digges invented a type of perspective or proportional glass around 1540 to 1550 and that William Bourne attended a demonstration of the device in 1578. Leonard Digges was a surveyor and I think it is likely that he intended the device to be used in surveying applications. 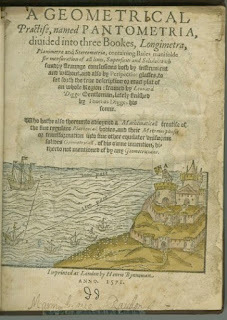 A copy of the cover of his book Pantometria shows a triangulation in progress. Leonard Digges died in 1559 but his son Thomas Digges was a keen astronomer and an exponent of the Copernican system. Another astronomer of the period was Thomas Harriot. What connects the two men is that they both possessed perspective glasses. It is hard to believe that two astronomers both with their own perspective glasses would not have been tempted at some stage to point them at the night sky. There is no hard indisputable evidence that they did but there are 'smoking guns' that suggest at least one of them may have done so. Thomas Harriot travelled to Roanoke Island off the coast of Virginia in 1585 and took a perspective glass along with him which he demonstrated to the Algonquin natives. He wrote and account of his voyage which was published in 1588.
" Most thinges they sawe with vs, as Mathematicall instruments, sea compasses, the vertue of the loadstone in drawing yron, a perspectiue glasse whereby was shewed manie strange sightes, burning glasses, wildefire woorkes, gunnes, bookes, writing and reading, spring clocks that seeme to goe of themselues, and manie other thinges that wee had, were so straunge vnto them, and so farre exceeded their capacities to comprehend the reason and meanes how they should be made and done, that they thought they were rather the works of gods then of men, or at the leastwise they had bin giuen and taught vs of the gods. Which made manie of them to haue such opinions of vs, as that if they knew not the trueth of god and religion already, it was rather to be had from vs, whom God so specially loued then from a people that were so simple, as they found themselues to be in comparison of vs. Whereupon greater credite was giuen vnto that we spake of concerning such matters." This tells us that the Perspective Glass was different to the Burning Glass and that it showed many strange sights but that is all. There is no mention of the night sky or astronomy. On returning to England Harriot made observations of the night sky using a Dutch Trunke but he never published his results and they remained until his notebooks were rediscovered in 1832. So why did Harriot not mention any use of the Perspective Glass in his Roanoke report? Possibly the images he observed were not good, or as he was writing an account of his voyage to North America he thought astronomical speculation would have been out of place in his report and would detract from his findings. As the Russian playwright and novelist Anton Chekhov wrote to his friend A.S. Souvorin "When one serves you coffee, do not think to find beer in it". Using the same logic when someone hands you a report of Roanoke Island from 1585 do not look for lunar craters in it! Which brings us back to Leonard Digges. After his death in 1559 he left his son Thomas in the care of John Dee who was to be his tutor. Dee had an extensive collection of lenses and mirrors so if Thomas Digges had ever had the intention to upgrade his father's Perspective Glass with top quality optics he would have had every chance to do so. There is evidence that Dee looked through the Digges Perspective Glass as he writes in his preface to his translation of Euclid. "He may wonderfully helpe him selfe, by perspective glasses. In which (I trust) our posterity will prove more skillfull and expert, and to greater purposes, than in these days, can (almost) credite to be possible". On May 14th 1574 Digges wrote a letter to Lord Burghley (MS Landsdowne No.19, Art 30) which is reproduced below. In his letter Digges mentions that he has sent Lord Burghley a little astronomical treatise containing observations, tables and 50 conclusions. However, although the letter remains the accompanying treatise Digges sent has been lost. Possibly it might be discovered some day like Harriot's notebooks but until then we can only guess at its contents. 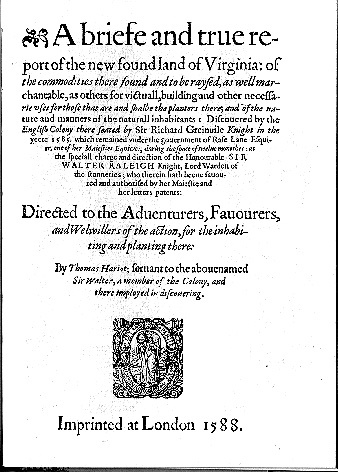 Possibly it might have been an advance copy of the 1576 edition of the almanac Prognostication Everlasting which contained an appendix containing an English version of Copernicus's Theories (see October 23rd posting), or additional material which Digges held back for a future planned book. We will probably never know. In 2004 a pamphlet was discovered in the Lambeth Palace archives that has been attributed to Digges but this concerns the Supernova in Cassiopeia and is not a match for the text described in the letter below. 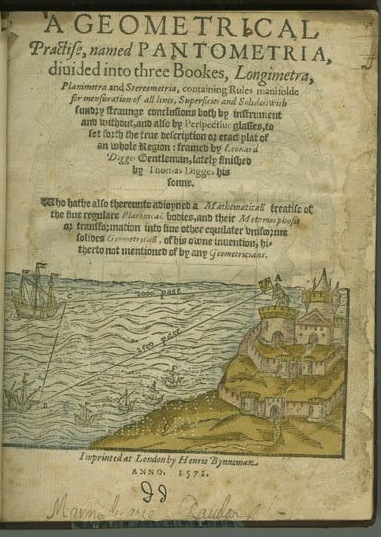 In his treatise on Arithmetic and Warfare called Stratioticus (the military one) published in 1579 and reprinted in 1590, Digges mentions in the dedication some forthcoming books that he intends to write but he never published any of these titles. “Bookes Begon by the Author, heereafter to be published. Commentaries vpon the Reuolutions of Copernicus, by euidente Demonstrations grounded vpon late Obseruations, to ratifye and confirme hys Theorikes and Hypothesis, wherein also Demonstratiuelie shall be discussed, whether it bee possible vpon the vulgare Thesis of the Earthes Stabilitie, to delyuer any true Theorike voyde of such irregular Motions, and other absurdities, as repugne the whole Principles of Philosophie naturall, and apparant groundes of common Reason". Thomas Digges was elected MP for Wallingsford in 1572 and then Master Muster for the English forces from 1586 to 1594. His interest in astronomy seems to wane during this period as he becomes more engaged with affairs of state, military matters and litigation. There is no evidence that Lord Burghley gave his backing for Digges'es little treatise to be published and he seems to have lost interest in it. Thomas Digges died in 1595 and his son Leonard was one of the financial backers of Shakespeare's first folio. The smoking gun is that Thomas Digges if did write a treatise of his own astronomical observations and given the fact that he owned his father's perspective glass (he demonstrated it to William Bourne) then should he have ever pointed it towards the night sky he would have been likely to have included any observations in his treatise if they supported Copernican Theory. Shakespeare's line about the infinite universe in Hamlet is likely to have been inspired by Digges and possibly also Venus'es glowing sphere. 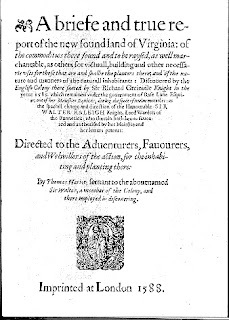 The Shakespeare and Digges families were connected so possibly echoes of Digges'es lost little treatise survive in Shakespeare's works. However, a smoking gun is not conclusive proof just speculation.